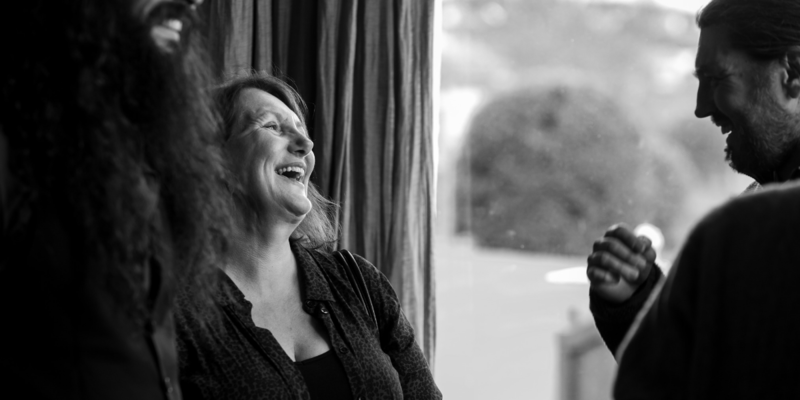 April 3rd, 2019 — It’s hard to believe that Lympstone Manor is only two years old.  Since the luxury contemporary country house hotel launched in April 2017, so much has already been achieved, including gaining and retaining a coveted Michelin star, membership of the elite Relais & Châteaux group, and countless awards and accolades including ‘Most Romantic Hotel in the UK’. Just a year ago, an 11-acre vineyard was planted with 17,500 Chardonnay, Pinot Noir and Meunier vines with the aim of producing top quality Devon sparkling wine. 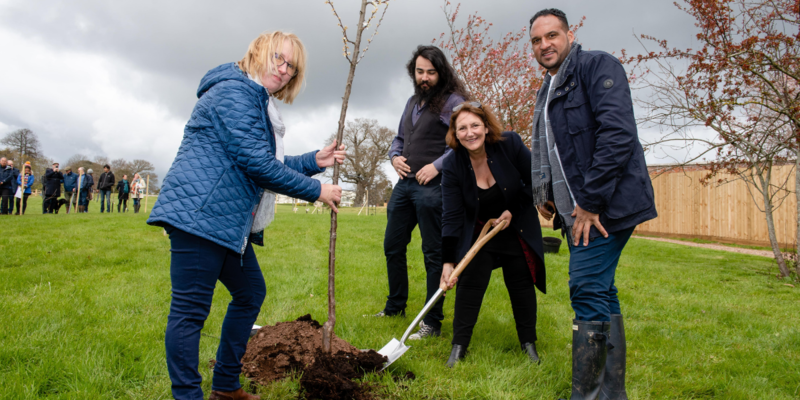 And now, to celebrate its second birthday, the grounds and parkland have been restored to their former glory (and some way beyond), and an extensive Sculpture Park has been launched in conjunction with Fine Art @. 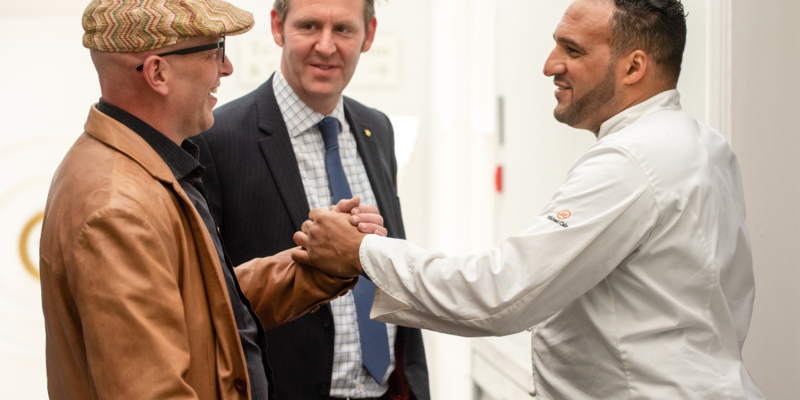 On a bright, blustery and sometimes showery April day, some 70 invited guests including more than 20 sculptors joined Michael and his team at Lympstone Manor for this important and prestigious moment. 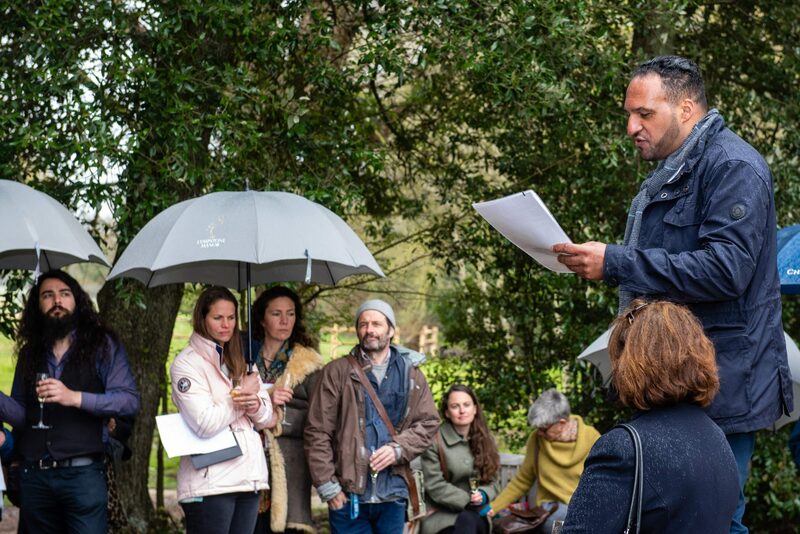 After coffee and tea in the Berry Head dining room, everyone togged up and headed outdoors for Michael to take us on a guided walk and tour through the newly renovated grounds, Ladies Walk (first laid down in 1760 by Charles Baring), and restored estate ponds. Michael directed us to stroll in a precise order and direction, enabling us to pause at almost all of the 53 sculptures on outdoor display. Michael introduced and spoke about each sculptor, giving background information about the artists and their work. Those sculptors who were in attendance then said a few words about the work on display, the inspiration behind it, how it was crafted, or what it meant to them, symbolically and emotionally. The variety of works on display in the Lympstone Manor Sculpture Park is truly remarkable, from abstract to figurative and conceptual genres, covering a range of different subjects, techniques, styles, materials, methods of creation, scale, and underlying philosophy. This is a carefully curated collection, with the placement of each work in the natural setting of Lympstone Manor’s 28-acre parkland precisely considered by artist, curator and Michael himself. The overall effect is hugely impressive, taking the concept of environmental art to another level. 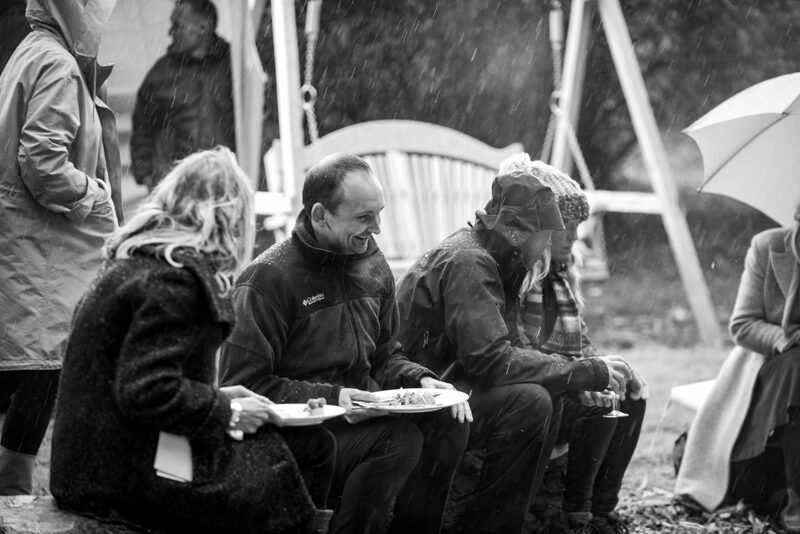 So many works are strikingly powerful within the setting of Lympstone Manor’s parkland. The following are a few examples (though on another visit, another stroll along the Ladies Walk, there could be a host of others that would equally catch my eye and attention). The woodland path that leads from the car park is the area that many visitors and guests pass through as their first entrance to Lympstone Manor. Here, set amongst the trees is a discreet collection of sculptures of birds by Paul Harvey: Tawny Owl, Bittern, Gannet, Herring Gull and Barn Owl. These works, stylised yet representational, immediately place us within a natural setting yet also lead us out of it. As we emerge to see the Manor and the view of the estuary, we encounter Pete Tatham’s Atlas: Dust to Dust. Pete explained how the idea first came to him during illness and convalescence, the feeling that we are sometimes carrying on our shoulders the weight of a crumbling world. Paul Gudgeon’s Bird of Happiness, by contrast, placed above the steps overlooking the entrance to Lympstone Manor, has become almost a symbol of this special place, its soaring form embodying all the joy and pleasure that a visit here brings. 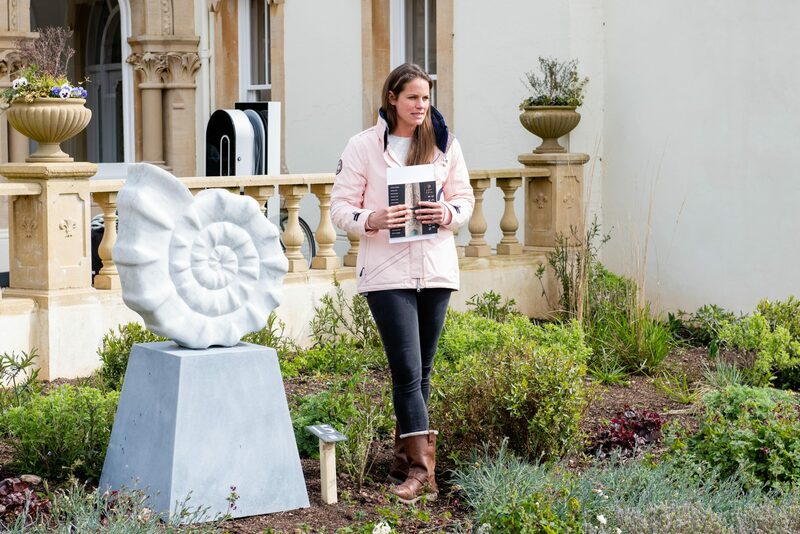 Some sculptures are naturalistic, like Lucy Unwin’s Illios, a fossil-like form carved out of Carrara B marble, gently reminding that Exmouth is the start of the Jurassic Coast, where rocks and the fossils embedded record 185 million years of the Earth’s existence. Other statues are purely abstract in nature. I particularly enjoyed the Japanese-influenced work of Alyosha Moeran, notably Lift, its wing-like solidity almost impossibly light. 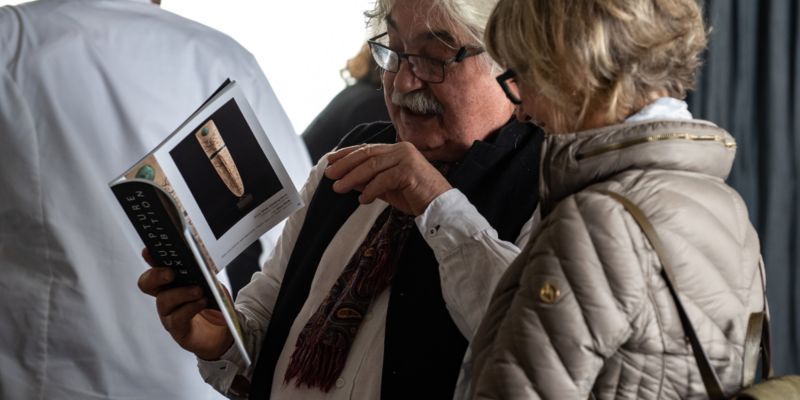 Peter Hayes’ White Standing Stone has inscrutable carvings, lines, etchings and natural fissures, the patterns seemingly representing some unknown language or meaning that we need not understand to appreciate. Dominic Welch’s Rising Form VI, a large polished bronze, stands boldly in front of the hotel’s new wing, as if almost a symbol of rebirth and regeneration. Guy Stevens’ Twisted Black Matter is another abstract form that seems in perfect harmony within the Lympstone Manor parkland, black stone contrasting against the white of the Manor behind, solid yet light through the delicacy of its points of contact. As we proceeded through an area known as the Meadow, where the parkland grasses will be left to grow tall, we come across a delightful collection of figurative sculptures by Sara Ingleby Mackenzie which Michael affectionately calls his ‘gals’. Indeed, you could almost imagine these elongated, Giacometti-esque figures — Calypso, Uptown Girl, Daiquiri, Poison Ivy and Mahrani — with their long legs, stilettos and accessories, in the bar or on the terrace of Lympstone Manor, enjoying gin cocktails or flûtes of MC Champagne. Whisper, by Carol Peace, is one of the most beautiful and striking works, sited by the top of the vineyard, a bronze-resin sculpture of a mother joyously balancing a soaring, acrobatic child whose legs reach to the sky. How far can you go? it seems to be saying. In addition to the placement of the sculptures throughout the parkland, an immense amount of work has been carried out during the winter months by the Lympstone Manor grounds team, led by Ricky George and James Matyear. The restoration of the ponds, with the addition of hand-carved bench swings by Sitting Spiritually and with further sculptures placed on the ground or peeking through the leaves, makes this a particularly peaceful and beautiful spot for guests and residents to visit within the Lympstone Manor estate. 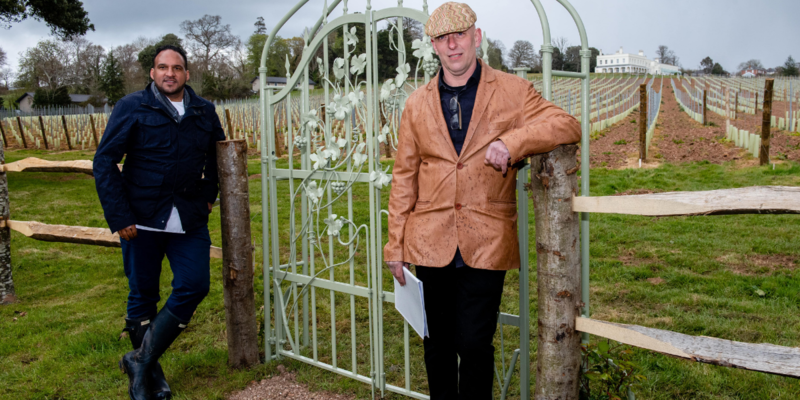 The adjacent vineyard, meanwhile, has been enclosed with a split timber fence, and the vineyard entrance adorned with specially commissioned wrought iron gates decorated beautifully and intricately with trailing metal vines and hanging bunches of grapes. 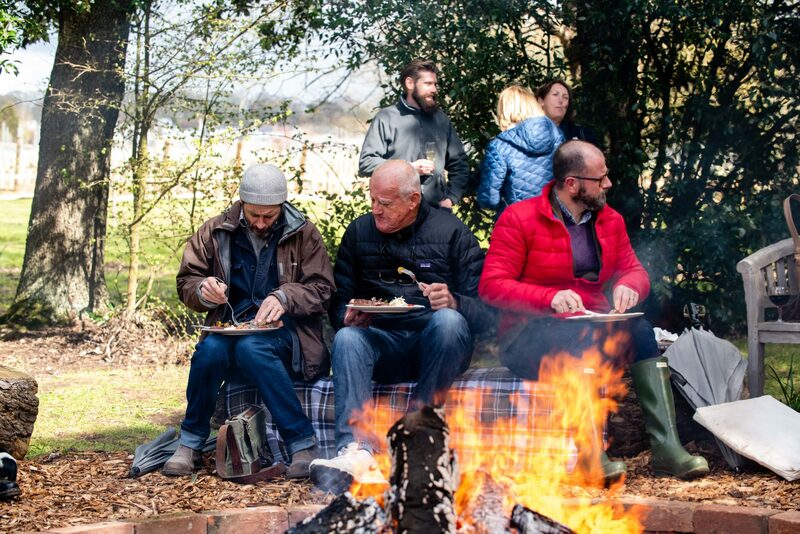 From here, Michael now led us to an area just up from the Exe estuary foreshore where we were invited to sit on log benches around a fire pit, while the Lympstone Manor prepared an outdoor feast. Michael summed up: “The landscape at Lympstone Manor and its view are such a huge part of why people enjoy the experience here. Now our fully restored ponds are once again a feature within this landscape, with the Sculpture Park elegantly arranged around the historic Ladies Walk, enhancing the special sense of place. Each work of art is unique and takes a visitor on a creative and magical adventure as you wander through our garden paths. Thank you to all those involved”. 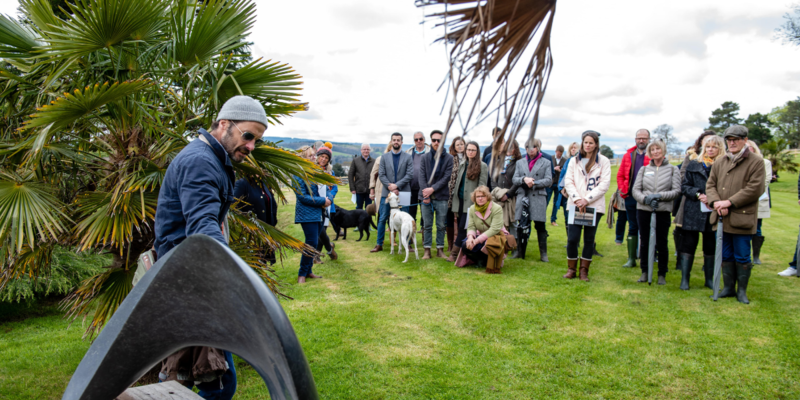 We all raised a glass of Champagne to toast Lympstone Manor on its second birthday, and to toast the success of the brilliant new Sculpture Park and the important partnership with Wendy Adams and Fine Art @.